Last week several SCBWI members, authors and illustrators, went to the official launch at Foyles, London, of the new children's book imprint, Flying Eye Books (note there's a nice animated introduction to their site, to watch especially if you have a child on your lap!). Bridget Strevens-Marzo and Anne-Marie Perks report. 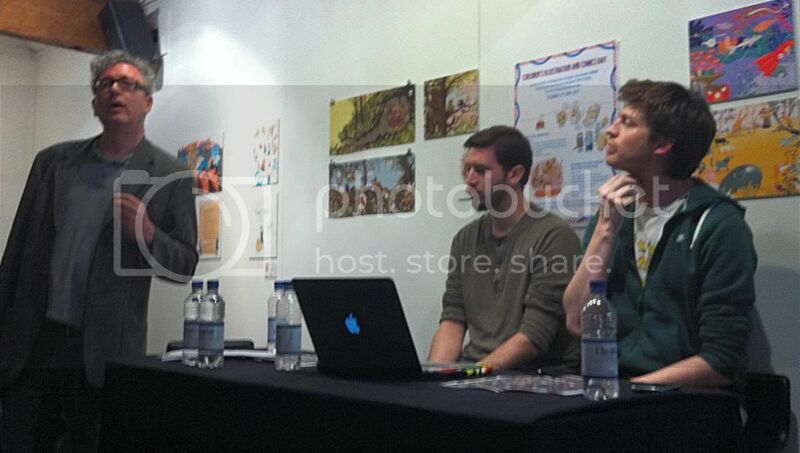 Varoom editor John O'Reilly (left) introduced Flying Eye - and Nobrow - founders Alex Spiro (centre) and Sam Arthur (right) talked about how they came to create it. It’s always a treat to meet publishers whose 'hands-on' editorial decisions are fed by an energetic, wide-ranging vision and driven by a clarity of purpose and courage. I stumbled on Nobrow 2 magazine online with its striking jungle cover by Blexbolex and immediately ordered a copy. I was doubly happy to see it in full: one of my favourite child-friendly French illustrators, Marc Boutavant (whom I'd invited to our SCBWI Bologna conference in 2008) had a spread in it, and what a beautiful object it was! The original colour combinations, paper quality and format reminded me of another stunning magazine from the 1930s, Verve, published by Swiss publisher Tériade which published Matisse cut-outs years before they were widely shown. But who was this London publisher? How had they managed to dig out illustrators from all over the place to work to a set theme? I learnt from their Foyles talk that Alex Spiro was brought up in Geneva. He and Sam Arthur had both been passionate book collectors from an early age and had both studied at Central St Martins at different times. They met and worked together on various commercial and music video projects before they had the idea of making a printed magazine. They talked about some interesting influences - familiar to previous generations too as library stocks weren't renewed - including all kinds of non-fiction children's titles like this. And in Varoom 21, Sam Arthur also cites the books of Raymond Briggs, David McKee, Shirley Hughes, Richard Scarry, John Vernon Lord, Sendak, Eric Carle, Pat Hutchins, Rosemary Wells and Peter Spier, to name only a few. But this was the Ladybird book that gave them a more specific grounding for their future. There's an inspirational archive up top to a small press to test run things and do the odd hand-made book on, and places where objects and ephemera are devised and designed alongside books, preparing for print runs sometimes as big as 6000 done externally. The Nobrow webshop reveals an impressive range of formats, from hardback French style 'albums' to the Ladybird-sized hardbacks such as the wordless Birchfield Close and Dockwood by John McNaught, from pull-out 'leporellos' to small books, the 17 x 23s, offering a terrain for new comic authors to create interesting stories manageable in length. One such comic artist was Luke Pearson who was still at college when he made Hildafolk. We can thank the antics of his young heroine Hilda (whose mum draws for a living, by the way) for leading Sam and Alex to create a distinct children's imprint, partly so that more children (and their gate keepers who might never venture near comic book shelves) would have the chance to enjoy her adventures along with other children's books Alex and Sam (now a dad) were keen to develop. The first author to make a new book under the Flying Eye imprint is Vivian Schwartz, Welcome to my Awesome Robot. (I wrote a brief introduction to it with an interview here, in Varoom 21 which is on sale now) and there's more about this and Viv's history of making things here in the Playing by the Book blog). 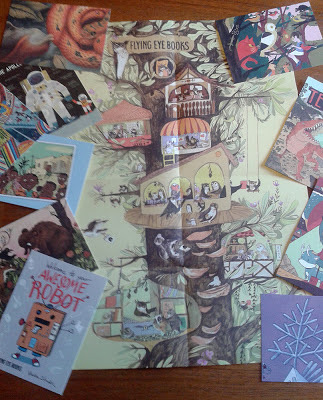 I'm also looking forward to seeing Wild by Hawaiian Emily Hughes who designed this Flying Eye treehouse poster we were all given at the launch. We were lucky to be able to buy advance copies of some other books bought as co-editions, including the exquisite co-edition with Hélium, France, One Night for from here, by Julia Wauters and Monsters and Legends by Davide Cali and Gabriella Giandelli, were testament to their desire to show 'the best of illustration and narrative art from newcomers and veterans in the UK and around the world" and the display in the Foyles gallery until May 13th testifies to their openness to diverse styles and approaches. I'm sure Flying Eye will do well with a savvy new generation of small kids who, alongside playing on screens as well as with cardboard boxes, paints and pillows, will appreciate lovely books to hold and smell, and stories to dream over. What more could you wish for except that Flying Eye books fly off the shelves, and that Sam and Alex (who will be setting up US arm of the company in New York later in the year) aren't overwhelmed by author-illustrator submissions. I sense that Sam and Alex are clear-headed enough to cope with anything and as they say, "we do everything in our power to ensure that they look good, smell good and most of all tell great stories! This was the amazing pack left on every chair in little pink and white striped paper bags reminiscent of the bags you purchase sweets in. The poster was illustrated by one of their new illustrators, Emily Hughes. True to their take on printing, attention to paper, ink, artwork, the postcards are printed on a matt, slight textural heavy-weight paper. Sam and Alex started with their childhood influences including very cool LadyBird books with amazing realistic gouache artwork, in non-fiction books. Other books they showed, and there were a lot of them, highlighted varieties of sheep - great ink drawings, and another was a Japanese version of Godzilla. 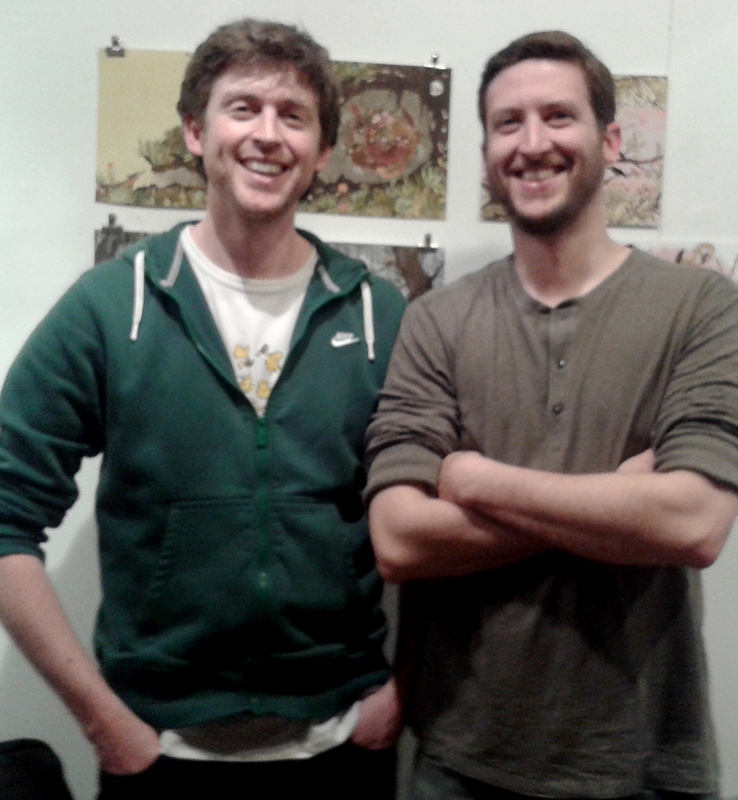 Both graduates of Central St Martins, their reasoning behind the first Nobrow was to offer a platform for great art, print and printmaking. 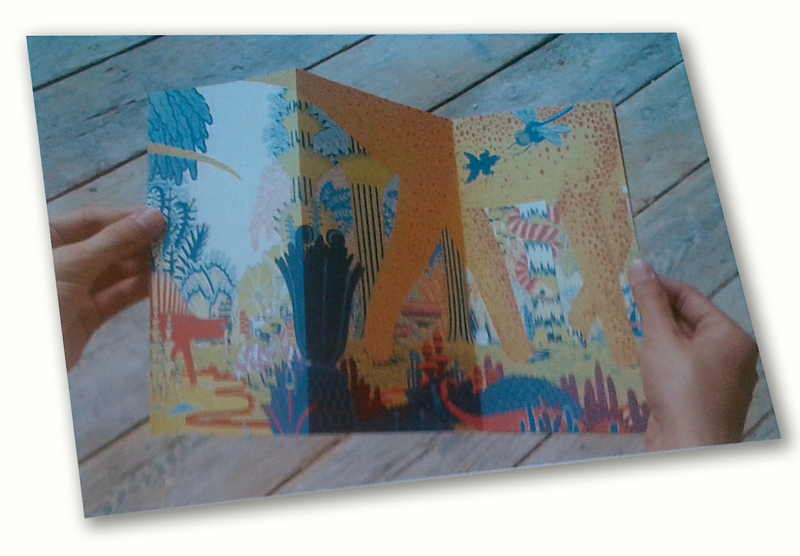 Above is an example of one of their accordion fold non-fiction books, Rise and Fall, Concertina of Life by Micah Lidberg. I took this photo off of the screen, so follow the link for a much better image. 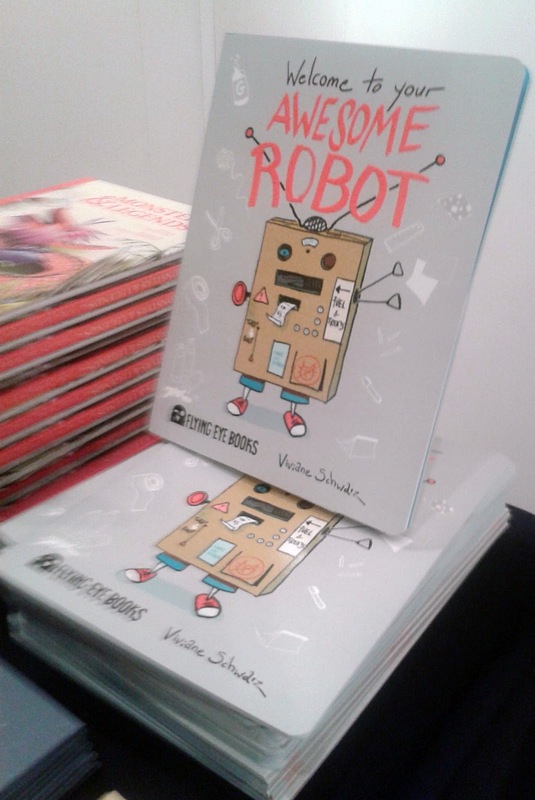 The table in the talk was covered with books alongside Viv Schwarz’s book, Welcome to Your Awesome Robot. It’s full of all the wonderful stuff we did as kids. We all remember when cardboard boxes were rockets, robots, cars, trains, houses… Cardboard boxes and pots and pans, a child’s paradise! As an illustrator for children, I heard lots that I love to hear from a publisher. They are committed to taking a risk, trusting the artist and helping the process in ‘not’ a top heavy way. And I agree with them in that the printed book will not disappear. It will instead become more and more the book as object; beautifully printed pieces of artwork that showcases the stuff the iPad, Kindle or e-reader can’t - texture of paper, the smell of the ink, innovative bindings and that feel of holding a beautiful piece of storytelling in your hands. Love the Flying Eye treehouse poster by Emily Hughes. Great that Nobrow have now branched into children's books.